Longtime Royals coach is as determined as ever. Hopkins girls’ basketball coach Brian Cosgriff sat at the postgame interview table after the Royals’ 68-63 loss to Eastview in the Class 4A championship game, a pair of teary-eyed players to his right. It was the third consecutive season that Hopkins lost in the finals. If Cosgriff had been frustrated or bitter or dejected, no one would have blamed him. But when he was asked if he was tired of being runner-up, his response was firm. Before his closing remarks, Cosgriff was asked about the impact of something as simple, and out of one’s control, as the bounce of a ball. With Hopkins trailing by three with five seconds left, Raena Suggs’ three-point attempt caromed not once but twice off the rim before falling off. 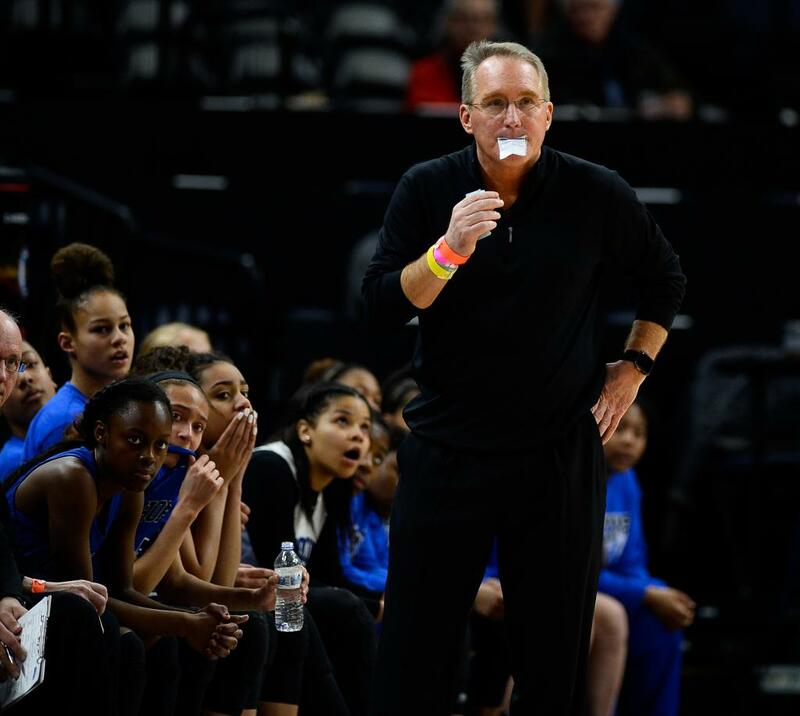 Cosgriff, who has coached six previous Hopkins teams to state championships, focused on the lessons learned despite the defeat. “What we told our kids is that for the last three years we’ve been here but we got to play together to the last day. That, in and of itself, is huge. Medals and trophies are going to sit on a shelf and collect dust, but memories and experiences are going to last a lifetime. This is just fun being here. I’ve been excited for the four days. Minneapolis North boys’ basketball coach Larry McKenzie said he could see it brewing the day before. The Polars were to play Brooklyn Center in finals of the Class 2A, Section 5 playoffs. Everyone expected North, the two-time Class 1A champion that moved up to Class 2A this season, to make another state tournament appearance. North had made short work of Brooklyn Center earlier in the season, winning by 22 points. Instead, Brooklyn Center upset the Polars 81-76 for their first tournament appearance since 1983. It didn’t help that North got into foul trouble quickly, forcing McKenzie to turn to his bench and use players who had played sparingly during the season. “I had to use guys that hadn’t played all year,” McKenzie said. Brooklyn Center ran out to a 37-27 halftime lead. North finally got on track in the final minutes of the game, but the Polars, who had been ranked No. 1 in Class 2A for a chunk of the season, saw their comeback fall short.